Mulher-hulk VS Titânia. Essa briga todos os fãns não se cansam de ver. Enfim, tirei um peso das costas esses dias que agora me deixa melhor! Enfim... passou o concurso do estado para professor. Felizmente, me sinto bem mais aliviado depois que isso passou. A partir de agora, é focar para Multiverso comic com RS. Que vai acontecer agora em junho! Pretendo estar com meu trabalho lá mas só mais adiante posso dizer o que estou preparando! 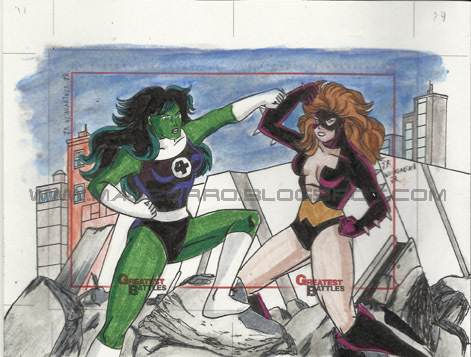 She-hulk VS Titania. This fight all the fans never tire of seeing. Anyway, I took a weight back these days, now he gets better! Anyway ... passed the state contest for teachers. Fortunately, I feel much more relieved after it passed. From now on, is to focus Multiverse comic con RS. What will happen now in June! I want to be with my work there but only later I can say I'm ready!